While there are differing opinions on starting systems, directors agree that the music itself is the most important component of a method. 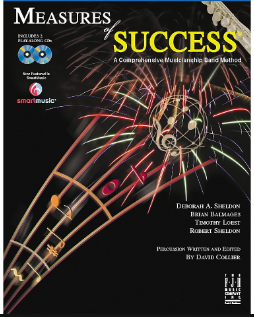 Every exercise in Measures of Success® has been sequenced to promote optimal development through great musical content. Creative titles stimulate the imagination, musicianship challenges promote expressive playing, and special attention is paid to important concepts such as phrasing. In addition, students will enjoy full band arrangements and original compositions by renowned composers Brian Balmages and Robert Sheldon. Directors will quickly discover that this performance-based method also introduces students to critical listening, composing, conducting, music history, and other elements that bring about a deeper understanding of music.